More profoundly, the newcomers brought different social and cultural ways that, over time, threatened the continuity of the Kootenai, Salish, and Kalispel (Pend d’Oreille) languages and way of life. In just three generations, the number of fluent Kootenai speakers fell to only a handful of individuals, one of whom was Adeline Mathias. Adeline’s first language was Kootenai. Her mother, Lizette Pierre, died in 1915, and Adeline’s maternal grandparents, Louie and Mary Ann Pierre, raised her according to Kootenai customs. Her grandmother’s father was Eneas Paul Bigknife, one of the last of the Kootenai traditional chiefs. As he had taught Mary Ann, she in turn taught Adeline: be kind, generous, and helpful to others. The Pierres also shared with young Adeline the tribe’s history—a history that dates back to over ten thousand years of occupation in the region that is now northwestern Montana, northern Idaho, and lower British Columbia. At one time, the Kootenais numbered several thousand, but epidemics of European infectious disease severely reduced their population. By the early twentieth century, the Ksanka band had only a few hundred members. Adeline’s grandparents were among those Kootenai who strove to retain their cultural identity in changing times. Thus, Adeline learned how to hunt, how to tan hides and sew clothing, and how to find, preserve, and cook the many foods that made up the Kootenai diet. Her grandparents followed the seasonal round that had guided their people’s subsistence for generations, and they passed this knowledge—and the history and values it contained—on to Adeline. The nuns of the Catholic mission in St. Ignatius also inspired Adeline. Despite her grandmother’s objections, Adeline attended six years at the Ursuline boarding school, where she learned Latin and English and developed her beautiful singing voice. Adeline found certain parallels between some of the Christian teachings and what her Kootenai grandparents had taught her, including the importance of kindness, hard work, and honesty. As she grew, Adeline demonstrated the self-reliance and morality her elders had instilled in her. She worked as a jockey in her teens, despite her height of nearly six feet, and for many years as a waitress, seasonal agricultural worker, and even a policewoman at regional powwows. Known for her integrity, she expected high standards of behavior. Throughout her lifetime she remained proud that she never relied on men for sustenance. 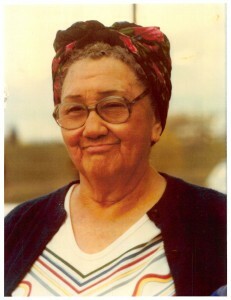 Adeline hunted deer and skinned, butchered, and preserved the meat by herself, even after she married Mitchell Mathias, the son of Chief Baptiste Mathias, in 1926. “I was a strong woman,” Adeline recalled. As one of the last fluent Kootenai speakers, Adeline Mathias was the repository of much of her tribe’s cultural knowledge and history. She understood that the survival of Kootenai culture depends on the preservation of the Kootenai language, since the language contains much of the tribe’s culture, history, and value system. However, Kootenai is a language isolate; no other related languages exist, so its preservation poses particular challenges. Determined to do her part, Mathias recorded many hours of Kootenai language for educational use, compiled oral histories into books for children, and helped create a Kootenai dictionary. In the late twentieth century, the Cultural Committee of the Confederated Salish and Kootenai tribes began an intensive effort to restore and record their tribal histories. One significant component of their work was the research into the tribal names for places throughout western Montana—the tribes’ traditional homelands. They prioritized this work because place-names often encapsulate tribal history, describing specific events or identifying resources the tribes gathered at those places. Mathias’s knowledge was instrumental to the project’s success, as she recounted numerous place-names and associated histories dating from her lifetime and back into the ancient history of the tribe—information that the Committee was able to record. In recognition of her contributions, Salish Kootenai College named its Technology and Computer Sciences building for her, while Adeline Mathias’s family created an endowed scholarship at the college in her name. Interested in cultural preservation? Read about Crow tribal member Pretty Shield’s efforts to preserve Crow culture by passing her knowledge on to her granddaughter in Pretty Shield’s Success: Raising Grandmother’s Grandchild. “Atliyi ‘Adeline’ Paul Abraham Mathias.” Char-Koosta News (obituary), February 15, 2007, 8. Plummer, Maggie. “Adeline Mathias: Going Strong at 95.” Char-Koosta News, October 20, 2005, 5. —. Passing It On; Voices from the Flathead Indian Reservation. Pablo, Mont. : Salish Kootenai College Press, 2008. Rave, Jodi. “Kootenai Matriarch, 95, Tribe’s Key Link to History, Customs.” The Missoulian. October 22, 2005. Salish Kootenai College. Honoring Native Women’s Voices: A Collection of Stories. Pablo, Mont. : Salish Kootenai College Press, 2006. Shelby, Velda. “Adeline Paul Abraham Mathias Kuki Palki.” Char-Koosta News, October 2, 2010, 2. Stromnes, John. “Many Fear That the Kootenai Language Will Die with Its Elders.” The Missoulian, August 26, 2000. Awesome, Katiti, just when I needed you! Hiy awesome kama! 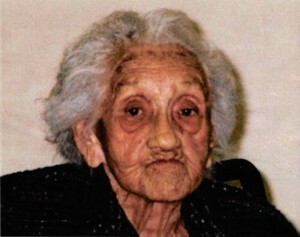 This is my Acmil (Great Grandmother) and I was lucky enough to have her in my life as long as I did. Long enough for my children to get to know their Great Great Grandmother. Love and miss you Acmil!